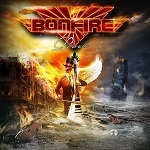 After the release of the album “GLÖRIOUS” that entered the charts, BONFIRE proved that they still have a great future to come – in 2016 they celebrate 30 years on stage! During their career, they performed about 1,500 concerts worldwide, touring with the likes of Whitesnake, Judas Priest and ZZ TOP. The eternal burning flame during all that time, the founder, composer, guitarist and the soul of BONFIRE is mastermind HANS ZILLER, who formed a band together with David Reece (voc./ USA/ ex- Accept), Frank Pané (lead-git/GER), Ronnie Parkes (Bass & Voc / USA) and Tim Breideband (Drums/GER) which further developed the sound of BONFIRE for the past 2 years and every day in a new way brings it to life. 30th BONFIRE ANNIVERSARY Tour 2016 "Burnin TALES n PEARLS"
BONFIRE will of course continue celebrating their live-qualities with their fans all over the world. For the 30th Anniversary / 30years live on stage they present the long desired double-album PEARLS (UDR-Music / Home of the Legends www.udr-music.com ) on March 18. It’s the first CD since the foundation of the band in 1986 that features all the classics in one place - re-recorded during 2015 in Milano (Italy) and arranged in a completely new way, as a big thank-you to the true fans. With the new partner UDR RECORDS Bonfire are in very good company with other big acts of Hard Rock and Metal, such as MÖTORHEAD, SAXON, GIRLSCHOLL and ANNIHILATOR. Hans Ziller & Co are now ready for the next step. CD1: BONFIRE "Classic PEARLS" (with the Italian - Symphony-Ensemble) and CD2: BONFIRE "Rock PEARLS"
The album contains 22 songs and presents the whole music production of all the 30 years of BONFIRE in the sound of 2016. Not moving ahead was never an option for BONFIRE and that’s why all rock-fans receive now with “PEARLS” all the band’s classics. 30th BONFIRE ANNIVERSARY Tour 2016 "Burnin` TALES `n `PEARLS"